Few events have had so profound an effect on the Channel Islands as the German occupation. As the only British soil captured by German forces during the second world war, their population endured five years of German rule and, towards the end, near starvation. Although the occupying power had banned all radios (and, where possible, confiscated them), enough remained on both Guernsey and Jersey for news of the war – and its coming to an end – to filter through. By early May, everyone, both local and German, knew that the Axis powers were beaten. It was only a matter of time before the islands were freed. As the days passed, the Royal Navy made radio contact with the German authorities, and a rendezvous was agreed. It would take place in Channel Islands waters on Tuesday 8 May, now known as VE (Victory in Europe) Day. In the event, the German surrender was a fairly pitiful affair. HMS Bulldog and HMS Beagle sailed from Plymouth to meet the German representatives off the Channel Islands. …we saw the German surrender ship. She was a dirty, battered minesweeper her sides red with rust, the paint on her superstructure chipped and discoloured. It seemed crudely fantastic as we watched, to see, heaved over the side of the trawler, a three-foot-by-six rubber dinghy. Three Nazi sailors climbed into it, followed by a young naval officer carrying an attaché case. This youth of not more than 23 or 24 was the German emissary. He sat in the stern of the dinghy, his seat a few inches from the water, the waves sweeping up and soaking him from the waist downwards. The wet emissary was Arnim Zimmermann (seen on the right, below. 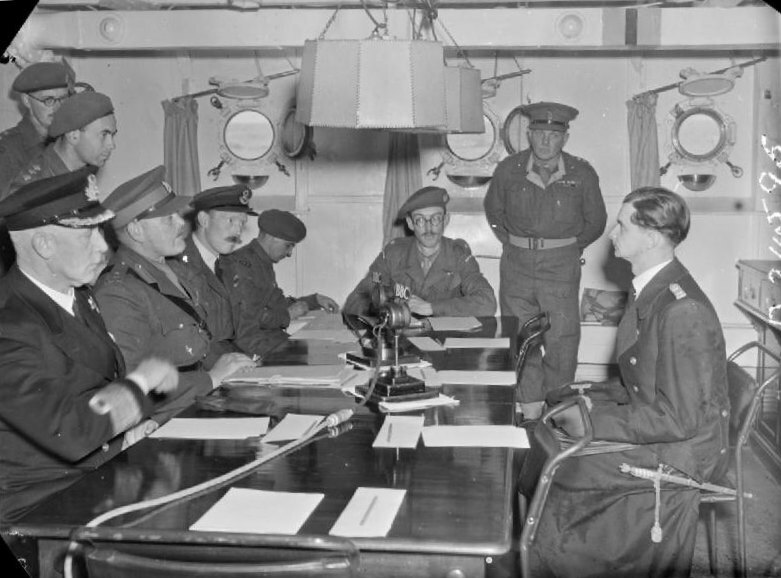 Brigadier Snow is opposite, sitting second on the left). He gave the Nazi salute when he boarded the Beagle, then went below deck to meet with brigadier Snow, who also supervised the liberation of Sark and Alderney on the 10th and 16th May respectively. The surrender didn’t happen right away. Zimmermann hadn’t been authorised to sign anything other than an armistice, which would start just after midnight the following morning. Snow pointed out that anything less than an unconditional surrender would not be accepted. He sent Zimmermann back to shore with surrender documents. In return, Zimmermann warned Snow that the Bulldog and Beagle would have to retreat. Otherwise, their continued presence would be taken as a provocation and they’d be attacked. At midnight, the Germans saw sense. Zimmermann returned with Major General Heine, who agreed to the surrender before he was allowed to board the Beagle. By seven o’clock the following morning – the 9th May – the papers had been processed and signed. Within the next quarter of an hour, the islands had been liberated. Twenty-two men of the Royal Artillery went to St Peter Port, Guernsey, to take over the island with a garrison of 10,000 Germans… The tiny force formed up on the docks, fixed bayonets, and marched towards the dock gates, behind which were cheering men, women and children. The church bells were ringing tumultuously and every house had its Union Jack bunting, saved through five weary years. Then the crowd broke through the dock gates, and embraced the artillerymen. Somehow they reformed and two girls with great Union Jacks led them into the town to the old Court House where Victor Carey, the Guernsey Bailiff, stood. The Union Jack was broken out and the crowd sang ‘God Save the King’.